Greetings and welcome to the first published humorq.com study brought to you by yours truly... Bob DiPasquale. I'm an application developer and a humor enthusiast. Like many humor enthusiasts I enjoy contests like the New Yorker Cartoon Caption Contest but I continued to get frustrated with their winner selections and I was convinced that most people would agree that mine were better. I set out to prove that and that's what brings us here. In 2010 I created a website called humorq.com where I host my own cartoon caption contest and I insist that entrants act as judges of a sampling of prior contest captions before being allowed to enter their caption for the latest contest. This means every caption sees a sampling of judges and based on their selection percentage I'm able to give every caption a score and every member maintains an overall all time score called their humorq. We give bonus points when a member is able to select what will eventually become the most popular of the captions on their list of five choices presented to them during voting. This prevents bias and keeps players from rushing through the voting portion. The site and contest is growing in modest popularity as it gets ramped up in it's current noncommercial mode. So let me give you a brief summary of the data before we get going. 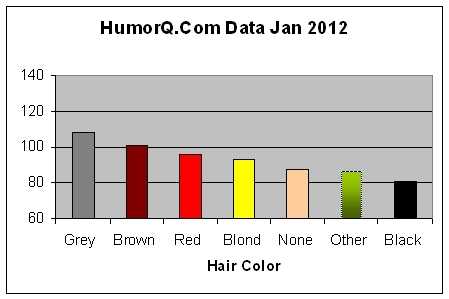 At summary time we have 3928 caption entries from 238 humorq members. Each caption was presented an average of 15 times on a list of 5 choices so what we have here already is mass judgements of over 50000 caption presentations. 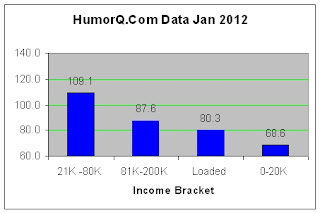 Humorq scores are scaled on a distribution between 0 and 200 so a Median humorq score Is 100. 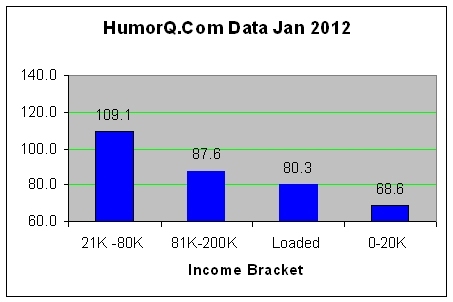 During humorq.com registration members are asked as an option to provide a number of demographics. Most chose not to provide all of them and no doubt some members don't take the demographic questions seriously (we are talking about funny people after all). So below I will try to provide my opinions of where the data was telling even with these considerations. Since being interested in this topic it seems I've noticed there's an article per month printed somewhere about whether men are really funnier than women. 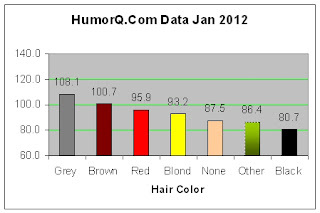 A recent study from the University of San Diego was done and actually used methods similar to ours at humorq.com although theirs was on a considerably smaller scale. 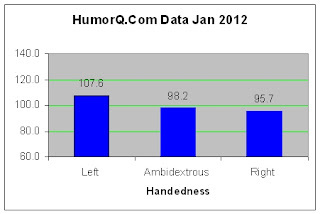 Our results are similar to theirs though and shows men with a slight edge. My wife is a very important person in my life so I have no plans to expand on this data ( so many people do anyway ). I think women are much better looking than men. I'll shut up on this one now. Moving on...quickly... I have some good news for us baby boomers... grey haired people are the funniest. That's right young people, you can mountain climb and all that but while you're up there we will be down here making people laugh. Blonds did not finish last by the way probably because they have overheard many good jokes. Its an election year right? Seems like an important time to note that democrats are funniest. Apparently they don't take anything seriously. Republicans ...well.. they made a showing but frankly I'm surprised many could stomach our member agreement. Funny thinking and conservative thinking...how well should that go together anyway? Hey Lefties!!! Way to go! Clearly more creative as has been a theory in a number of circles. In case some of you righties plan to start entering captions left handed, I don't think that's going to help. The class demographic is very interesting with the 20 to 80K coming out on top, followed by the upper middle class, followed by the wealthy, followed by those under 20k. Since I'm a member of the leading demographic I will conclude that the reason for us rising to the top is our familiarity with both tragedy and part time happiness. For fun one of the demographics I ask for upon registration is a simple NASCAR yes or no. 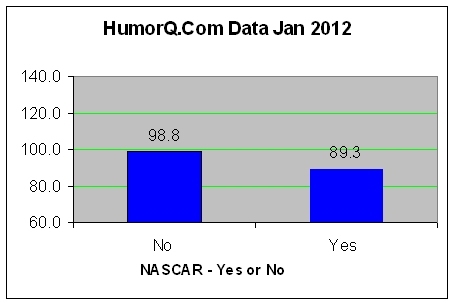 NASCAR no scored significantly higher. I should probably be more cautious not to offend offensives drivers but how creative can people watching cars go around an oval 200 times be? I invite additional NASCAR fans to join humorq.com to correct the data when they're done watching wrestling. 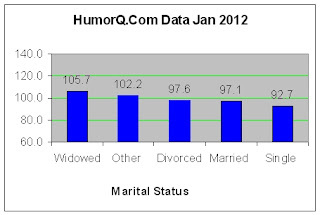 I find the Marital Status demographic an interesting result too. Apparently if your spouse dies there's an eventual enlightenment on what true humor is. My mom was a widow with six kids and never shot a gun at any of us so I'm sure her sense of humor was pretty high. The 'Other' marital status...well... it's fun just imagining the possible scenarios there. They don't classify themselves as single so I guess they are in the sort of relationship where they are free to make certain choices and that untethered spirit breeds funny captions.... yeah, let's go with that. 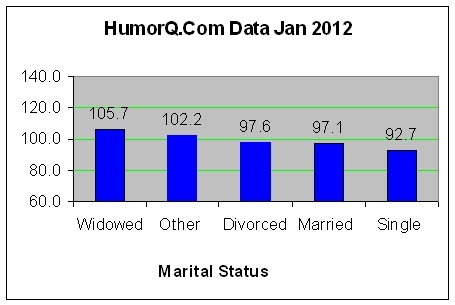 The single people are apparently preoccupied with their marital status. Congratulations self proclaimed spazzy nerdy people. You are the funniest. 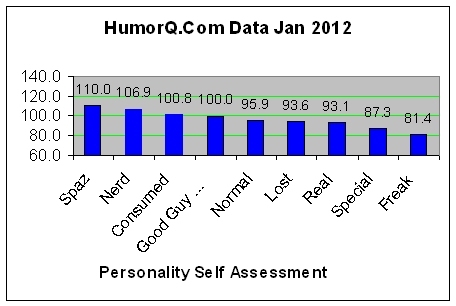 I would assume this includes Steve Martin, Will Ferrell, Jim Parsons and several more of my favorites although if one of the personality choices would have been "God Like" I'm guessing that would have been chosen by the funniest of the Spaz and Nerd demographics. Special and Freaky people continue to be misunderstood by the masses but quite possibly may be OK with that. There are some additional demographics not charted here due to their lack of data points so far including funniest states, cities, universities... but I'm hopeful our membership will grow large enough to include these demographics in the 2013 report. I mentioned at the start of this report that my motivation was to prove myself funnier than most so I'm sure you're all wondering where I fit in. 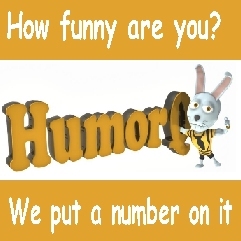 What's my humorq? I'm afraid I don't know. I unfortunately haven't grown this marvelous little exercise enough to step away and let others take the controls. A man with a good suit does not measure it himself nor will I. 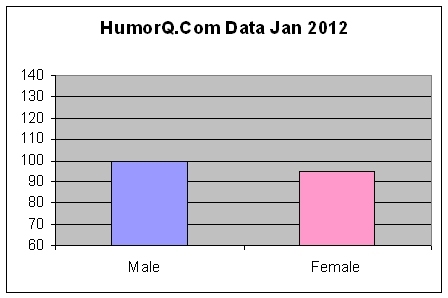 So please help us grow and spread the word about HumorQ.com if you plan to use this data and maybe I can get a new suit... if you know what I mean. Here's what I plan to do from here about this study ... I'm going to see if anyone with a recognized reputation will either publish or comment on it. Below is a list of people/organizations I will be sending this study to and ask for them to comment on the study itself and their interest in it. I can provide more details about the data upon request. Thanks for the note. 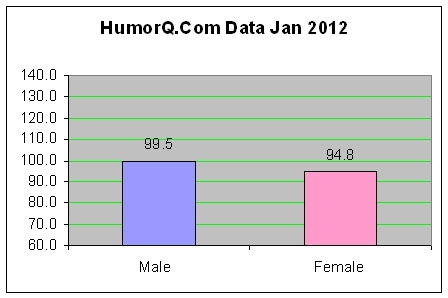 It looks like you are having a good time with your humorq study. At this time, I cannot commit to critiquing your work, but we (Joel and I) will keep you in mind as we pursue our humor code project. In the meantime, good luck with your project. Your enterprise looks like it might have potential, but I don't have time to look into the details. Sorry about that.